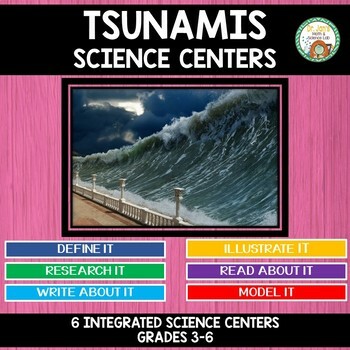 Engage your students in these independent science centers designed to give your students content background on tsunamis in a fun and engaging way. 6 centers are included. Center 2: Illustrate it: Students will illustrate a tsunami approaching a coastline city. 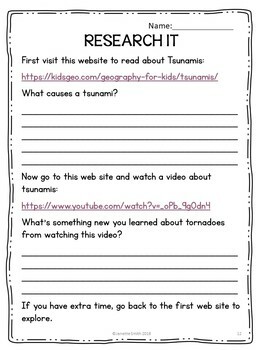 Center 3: Research it: Students use some online resources to learn more about tsunamis. 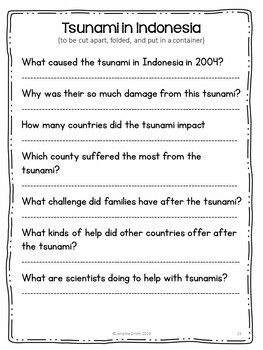 Center 4: Read About It: Students read a passage about the 2004 tsunami in Indonesia. They then choose questions to answer, and also have the opportunity to write some of their own questions. 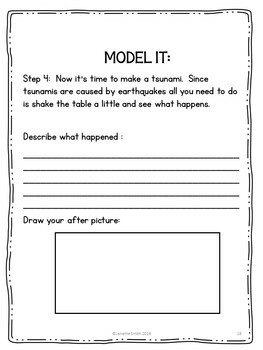 Center 5: Model It: Students will create a simple model of a tsunami using a baking pan, sand, and paper houses. Activity sheets are provided. Center 6: Write About It: Students assume the role of a newspaper writer and write an article about a tsunami that strikes the coast of Japan.